Some great new features have been added to the Contacts section allowing for a richer and more flexible interaction with your customers and suppliers. An overview page has been introduced to allow for simultaneous display of the contact’s details and their current financial position. 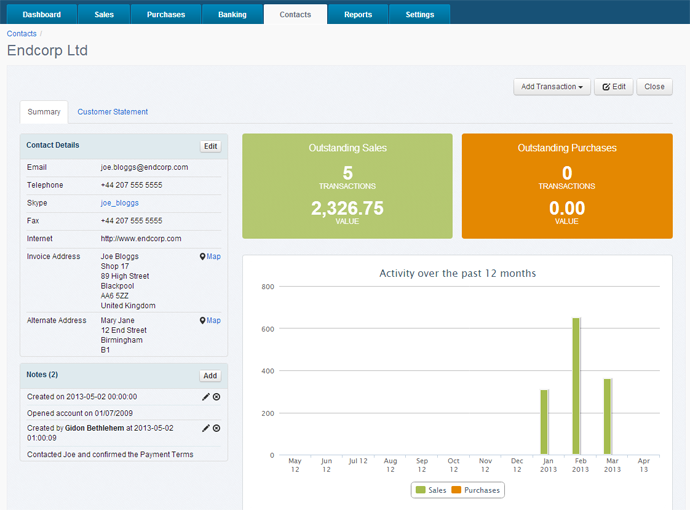 Transactions (Invoices, Credit Notes, etc) can be created directly from this view. An alternate or second address can be stored against each contact. The Invoice Address will be used by default but the alternate address can be selected as required in each transaction. You can now add unlimited notes against each contact. This will help you keep a chronological record of all your client interactions or you can leave notes and instructions for your staff members. The Email field has been enhanced to accept multiple email addresses. Use a comma to separate each address. Each contact can now have a Name and an Invoice Name. If used, the Invoice Name will replace the Name on the printout of Invoices, Credit Notes, Quotes and Orders. This is useful for separating Legal and Trading Names. Add in your contact’s Skype account id. A hyperlink will be available on the overview screen for one-click Skype calling. If you have entered an Invoice Address and/or Alternative Address, then you can link directly to that address through Google Maps.